This November OKA Release their much anticipated brand new album 'Milk & Honey' - proudly distributed by VITAMIN Records. With a signature sound and unforgettable live reputation, OKA is still serving their Progressive Roots music. Electrified Digeridoo, heavy slide guitar, soaring flutes and juju rhythms are some of the many ingredients in this Australian sound that’s matured over a decade. Humble beginnings busking on street corners have led to global tripping & independent CD sales in excess of 100 000 albums. Their past is unique and reflects a sun-drenched coastal lifestyle they call home. Here we find them with their 6th studio album ‘Milk & Honey’ that hints to be the most exciting yet. Incorporating flavours of Dub, Electronica, Hip-hop, Jazz and many forms of world music, for years people have tried to define the OKA sound. Instead, perhaps look at the line-up - Three characters with varying influences, backgrounds and talents. Stu Boga Fergie (Didgeristu), the big man behind the electronic beats & keys brings raw didgeridoo & vocals inspired by his aboriginal heritage. Chris lane plays captivating melody on Slide Guitar, Harmonica & Woodwinds including Bamboo Flute and Sax. Making up the trio is Samoan-Australian Charlie Zappa – a rhythm specialist with beats of Polynesian fire and deep pocket. Together they blend many pieces that is the OKA puzzle - A sound & force that touches the heart & feeds the soul. ‘Milk & Honey’ brings a fresh and exciting addition to the OKA catalogue. 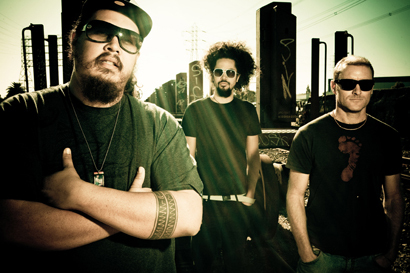 It was created from on-stage jamming & relaxed sessions at their home Coolum beach on the Sunshine Coast. While keeping true to their indigenous roots the 14 track journey touches on new territory with vocal tracks & a soup of synth tones & beats not straying too far from the classic OKA feel. SUNSHINE Coast trio OKA's didgeridoo-driven soft doof has made the earth move for late-night festival ragers all across Australia, Asia and North America in the past few years.